Mathematics and Economics double major. 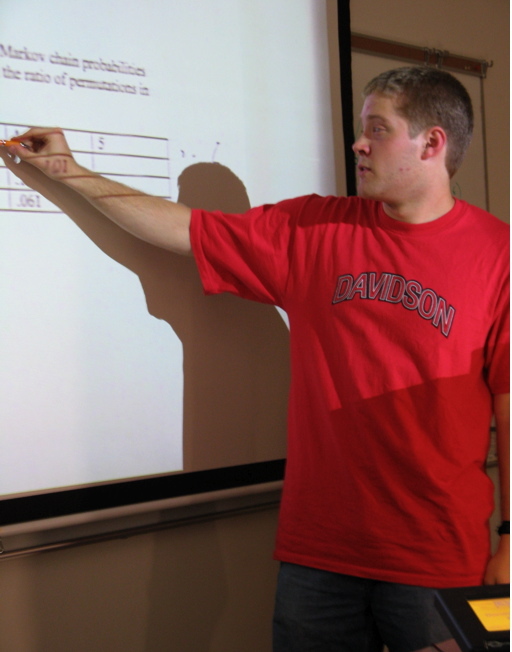 I'm doing math modeling for the Davidson / Missouri Western 2007 IGEM team. I do a lot of programming in Matlab. I've been looking at problems in the areas of probability and graph theory. The team as a whole is trying to use tools from Genomics to solve the Hamiltonian Path Problem and the Traveling Salesperson Problem. Please contact me if you have any questions regarding my work or math modeling / Matlab in general. I'm interested in graduate school programs in Applied Math and other math / problem solving intensive areas. In my spare time I enjoy playing chess, sports and other games. I'm actually a relatively strong chess player with a USCF rating of 2035 I'm one of the top 2500 players in the country and one of the top 200 juniors. As a Bonner Scholar I'm also very active in community service related activities. This page was last edited on 13 March 2008, at 07:42.